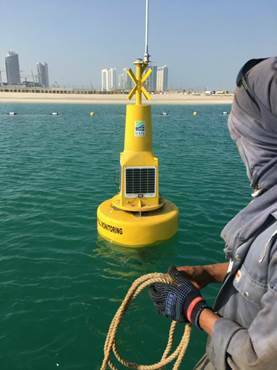 A network of eight environmental monitoring buoys has been installed off the coast of Abu Dhabi, UAE by Ocean Scientific International Ltd. (OSIL). 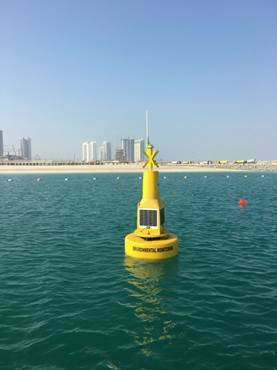 The 1.2m coastal buoys, installed in water depths ranging from 6-16m in various locations along the UAE coastline amid extensive coral formations and seagrass beds, are equipped with multiparameter sondes for water quality monitoring, and GPRS telemetry equipment. 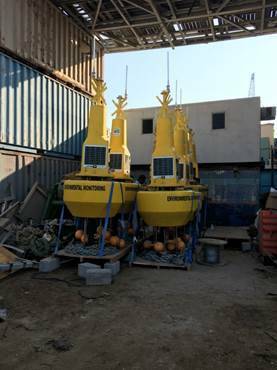 The robust buoys are designed for extended deployment in harsh coastal environments in a range of water depths. The rotationally molded PE hulls are foam filled to prevent the buoy sinking in the unlikely event that the outer hull is damaged. All instrumentation and cables are held internally and are protected by the rugged enclosed top section, which has been designed to minimize damage from the elements or interference. The stainless steel central structure removes the possibility of any corrosion issues, while offering good water flow for water quality sensors, while also providing a very high degree of protection for valuable, sensitive, or delicate equipment. 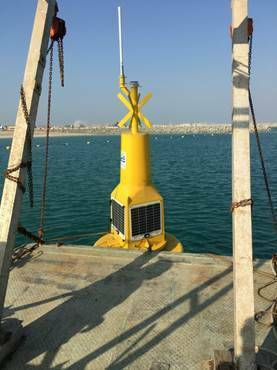 The platforms also offer a higher visibility profile, easily seen in high-traffic areas, and are suitable for all applications, including scientific studies, water quality monitoring, coastal engineering projects, harbor and coastal monitoring, and maritime traffic control. A range of telemetry options are available (UHF/VHF, GSM, GPRS, Satellite), selected to suit both the location and application requirements. OSIL provide a complete data telemetry solution, including either desk top or web-based software packages to access the data.